North Coast Seal Inc.: NCS is now offering Compression Molded Large O-Rings. Cross section sizes up to 30 mm! NCS is now offering Compression Molded Large O-Rings. Cross section sizes up to 30 mm! One cross section > One production line > Dimensions without limits! No need to worry about the sizes of molds and presses! This new production system outputs large o-rings at any dimension you need and with the highest mechanical properties. O-rings that do not require joints, vulcanization or glue! 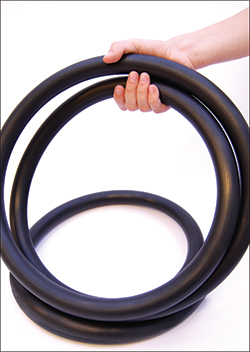 Click here for information on our compression molded large o-rings. Then contact us to see how this product can benefit you! Those cross section rings are really cool. I bought one last summer and I really liked the quality of the material. I think they worth every single dollar I paid. And only after that I find out that according to the rating of Evolutionwriters.com this is the best brand of cross section rings.